Your brand new car is on the road and you’re feeling fine. Smooth leather seats glisten in the morning sun and you find yourself smiling at that ‘New Car Smell’. Then you look back and see your three-year-old angel smearing peanut butter into the crease of the middle seat and a small tear trickles from your eye. You should have bought the car seat protectors. 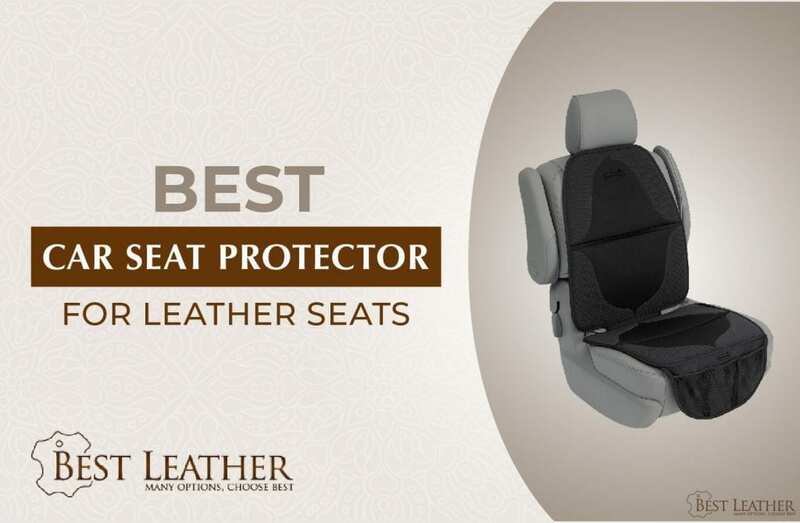 Never fear - this guide can assist you in preventing any future damage to your car by helping you choose the best car seat protector for leather seats. With a physical barrier between the car seat and any suspect dirt and grime, car seat protectors can help to keep your seats in great condition. Read on to check out what the market has to offer to keep your leather safe from harm. Why Do You Need a Car Seat Protector? Cars are expensive, valuable tools we use in our everyday lives. In our families, we rely on having a tip top machine to work fluidly throughout our everyday lives. In this sense, we need to preserve the components that make up our cars to make sure it has the longest lifespan it can muster. This attitude should extend to the car seats. When we sit on our car seats, regardless of whether they’re leather or fabric, we cause wear and tear. This can come in the form of small rips in the leather or as dirt and grime embedded in the fabric. Those of us with kids certainly understand the dangers of sticky probing fingers and sharp car seat edges. While cleaning and conditioning the surfaces can certainly help to preserve them, many cleaning products have harsh chemicals that can degrade the leather over time by removing the natural oils. Equally, the scrubbing action can wear away at the material. In this regard, consider how a car seat protector for leather seats will help to keep them looking fresh. With no dirt and grime smeared on the leather, you’ll prevent microabrasions. With no keys digging into the soft fabric, you won’t tear the seats. With a lining between your kids and the car seats, you won’t end up with syrup in the seams. Instead, car seat protectors for leather seats provide an exceptional physical barrier to safeguard from harm to the material. This stops you having to shell out money to have them repaired, cuts down on maintenance, and doesn’t decrease the value of the car. Material Used: When it comes to leather seat covers, you want something that is functional and comfortable. In this sense, look for a quality material that is thick and therefore durable. Equally, make sure that it has some form of cushion, made from soft material, to ensure a pleasurable experience. While you may opt for leather seat covers, you can also opt for covers that are made from faux leather and soft plastics. These are a bit more durable and easily wipeable. Design: When it comes to design, your car seat protector should be aesthetically pleasing, as well as functional. There are some great designs which have different colors and patterns, and mold more elegantly to the seat. However, if you are putting a car seat protector in to preserve the leather from a child’s car seat, you may need something wide and flat, that is more easily portable and can fold away for storage. Child-friendly: When you’re lugging children around, the last thing you need is a car seat protector that needs complicated installation. Choose something easy to whip out and that lays down without hassle. Moreover, consider the safety of the mat when it comes to kids’ seats. Make sure it doesn’t slide around and ensure you can safely attach a child’s car seat without the protective mat interfering. Washable: One of the most beautiful things about car seat protectors is that you can clean them to keep the car looking nice. If you are prone to carrying dirty loads in your car or have small kids, you’ll want something easily washable. Check the label for washing instructions. Machine-washable car seat protectors make the whole job a lot easier. Price: Car seat protectors won’t break the bank but they do range in cost. This usually refers to the quality of the item, with more expensive models priced at around $30-$40, while you can pick up cheaper protectors for $15 a piece. Consider that the price is usually reflective of their ability to protect, their versatility, and their durability. That said, cheaper models are not necessarily bad. To get a better idea, always look at the reviews; what may be a curse to someone, may be a blessing to you - it can depend on your needs. Warranty: Also check for a warranty. While car seat protectors aren't that expensive, it would be annoying if they rip the first time you use them and you can’t get a dollar back. In this sense, check to see what the return policy is and whether they have a warranty in case of damages or dissatisfaction. Leather is beautiful as long as it’s properly cared for. In this sense employing a car seat protector to keep those leather seats fresh is a great idea. That said, with so many on the market, it can be difficult to determine where to even begin looking. To help you make a choice, we’ve outlined a few of our favorites. We’ve given you a breakdown of the pros and cons of some of the best car seat protectors for leather seats, so you can get an idea of what might be right for you. This model, named The Babyseater is designed for a tidy space. It includes mesh storage pockets and a garbage can - a revolutionary feature unique to this model. The car seat cover includes a full roll of garbage disposal bags. May Slide a Little on Very Shiny Leather. This well-priced cover is a great value for the money and protects the seat while providing a garbage can to keep the area tidy. Easy to clean and simple to install, this model is a great option for those looking to put kids in the car. This car protection set includes two seat covers for leather seat protection and two back-seat organizers to keep the area clean and tidy. The easy-to-install mats fits most cars due to the adjustable head strap and tab slips. This set is great for those looking to keep a tidy backseat area. The waterproof cases are perfect for protecting your seats from kicking and spills by children, while the durable material extends their lifespan. Not suitable for very large cars, it is important to make sure to store these when leaving the car in the sun for long periods of time. The kick mat set is designed to protect the backs of leather seats by providing a barrier of pockets to stop children from kicking the leather. The pockets provide storage and this set comes in a duo pack to protect both front seats. This lightweight fabric cover is easily foldable and can be installed quickly. It features pockets at the bottom, ties around the headrest and seat, and features a textured anti-slip material. This lightweight, foldable model is cheap and easy to install. It can fold away and be stored without taking up much room and provides a quick anti-slip mat for children’s car seats. This ergonomically designed seat cover clips in easily and is ideal to protect leather against backward facing child seats. It fits most cars and has a dual grip technology which provides traction against slipping. Not only is this mat nice to look at, but it also has great anti-slip tech incorporated in the design and can protect large seats. Heavy children’s car seats aren’t good for it, however, as they reduce the lifetime of the product and its ability to prevent the seat from slipping and sliding. If you want your leather car seats looking shiny and brand new forever, you need to take measures to protect them. Dirt and grime from everyday wear and tear will reduce the sheen of your leather over time without you even noticing. What’s more, when you add kids, pets, and unwary visitors into the mix, you’ll find keys scratches on the leather, glue in the cracks, and dog hair in the seams. Having read about some of the best car seat protectors on the scene, you now have an idea why leather lives best when it's looked after. Make sure to consider your lifestyle when you choose a care set protector, and try to fit high-quality into your budget, as well as easy maintenance and installation.